The 3D plot functions intended for plotting meshes and surfaces 'mesh' and 'surf', and their several variants 'meshc', 'meshz', 'surfc', and 'surfl', take multiple optional input arguments, the most simple form being 'mesh(z)' or 'surf(z)', where z represents a matrix. 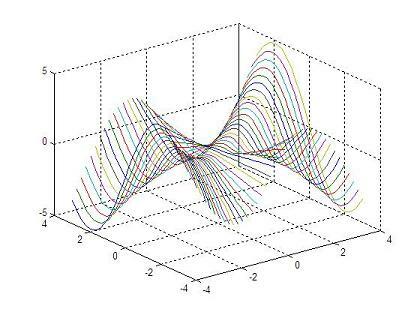 Usually, tridimensional curves are represented by the values of z-coordinates samples on a grid of (x,y) values. 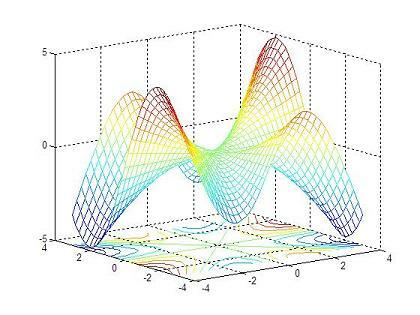 Thus, to create a surface or 3D plot we first need to generate a grid of (x,y) coordinates and find the height (z-coordinate) of the surface at each of the grid points. 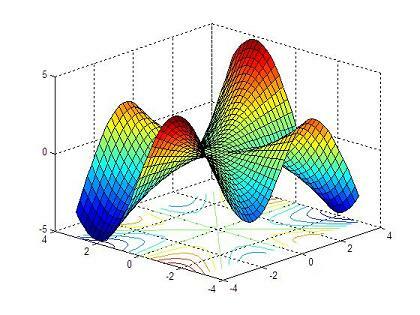 Matlab provides the function 'meshgrid' to create a grid of points over a specified range. 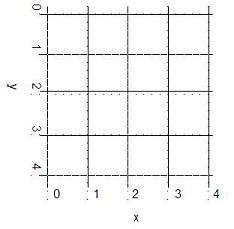 We can create two matrices x and y, each of size 5 x 5, and write the xy-coordinates of each point in these matrices. We can then evaluate z with the command z = x.^2 – 10*y + 2. However, creating the two matrices x and y is much easier with the meshgrid command. The commands shown above generate the 25 points shown in the figure. All we need to do is generate two vectors, vx and vy, to define the region of interest and distribution or density of our grid points. Also, the two vectors need not be either same sized or linearly spaced. It is very important to understand the use of meshgrid. See the columns of x and the rows of y. When a surface is plotted with the 'mesh(z)' command (where z is a matrix), the tickmarks on the x and y axes do not indicate the domain of z but the row and column indices of the z-matrix. Typing 'mesh(x,y,z)' or 'surf(x,y,z)' (where x and y are vectors used by 'meshgrid' to create a grid), result in the surface plot of z, with x and y values shown along the respective axes. The folowing script could be an example of how tho use the 'meshgrid', 'plot3', 'meshc', and 'surfc' commands.